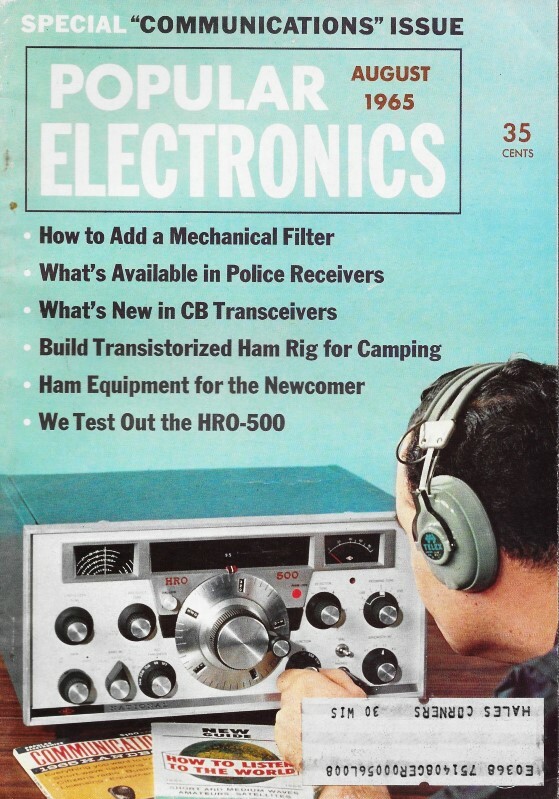 Restoring and/or upgrading vintage radio receivers is still a very popular pastime for hobbyists, and for that matter for some professional servicemen who preform maintenance on established equipment installations. Three of the most significant changes that can be made to older receivers to improve sensitivity are to clean up the power supply DC output, replace noisy components like vacuum tubes and leaky capacitors, and tune / modify / replace RF and IF filters. This article discusses a method of replacing a stock LC filter with a high selectivity mechanical filter. The nice thing about an analog receiver is that narrowband, steep-skirt filters can be substituted without concern for group delay at the band edges that can (and will) wreak havoc on digital signals. 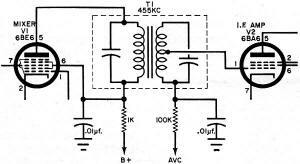 If your receiver or transceiver employs a 455-kc. Lf. strip, sharp selectivity can be achieved by substituting a recently introduced mechanical filter (Lafayette 99 K 0123) for the first i.f. transformer to help you cope with today's crowded radio bands. Several important advantages make this installation highly desirable. Steep skirt selectivity makes it possible to overcome the masking effects of strong or local signals as little as 5 kc. away. Once the filter is installed, it doesn't need to be adjusted while the receiver is in operation. No objectionable effects such as ringing or hollow sounds commonly associated with crystal filters are present. The filter can be installed in most vacuum-tube-type amateur, commercial, or CB equipment. Finally, it works well in AM, CW, and SSB receivers. How It Works. 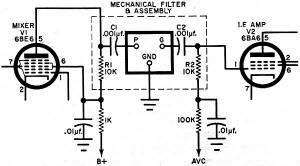 The mechanical filter is basically an electromechanical device. 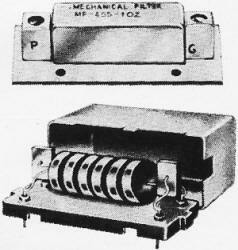 It consists of an input transducer, a resonant mechanical section having several metal discs, and an output transducers, as shown above. Both transducers are crystal types. 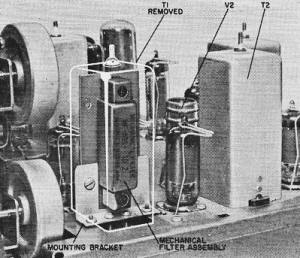 An electrical signal applied to the input transducer is converted into mechanical vibrations which travel through the resonant mechanical section to the output transducer, where they are reconverted to electrical signals. Fig. 1 - Bandwidth of 2 kc. at 6 db expands slowly to 6 kc. at 60 db. Steep skirt characteristic makes it possible to separate closely spaced stations. Fig. 2 - Typical receiver first i.f. stage before modification. Internal circuitry of transformer can be ignored. However, the frequency of the mechanical filter should be the same as the transformer to be replaced. Fig. 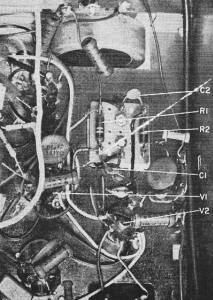 3 - In addition to the mechanical filter, only two capacitors and two resistors are added (within the dotted lines). Once the filter is installed and the remaining i.f. transformers have been peaked, no further adjustments need be made. Fig. 4 - Mechanical filter and added components are grouped together into a subassembly and mounted in the same manner as the original i.f. transformer. Fig. 5 - Bottom view of receiver before the first i.f. transformer (T1 ) is removed. It is not necessary to disturb any other part of the receiver. The selectivity characteristics of the filter are determined by the resonant metal discs. Each disc is carefully machined to extremely close tolerances to make it vibrate at a desired frequency, such as 455 kc. The discs are made of a ferro-nickel chromium alloy for extreme hardness and resistance to corrosion. Each is supported by - and coupled to the others with - a thin rod. The rod runs the entire length of the filter, and is attached to the transducer at each end. Only those signals within the filter's passband can get through. 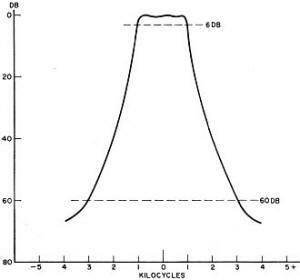 Nominal bandpass characteristics of the filter used in this project are shown in Fig. 1. 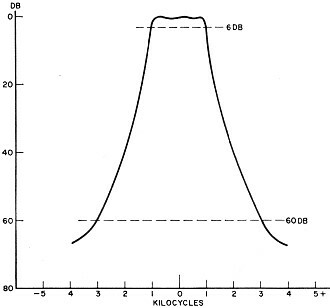 At 6 db down on the response curve, the bandwidth is approximately 2 kc. ; and at 60 db down, the bandwidth is approximately 6 kc. It is natural for mechanically resonant elements, such as metal discs, to have multiple resonances which allow spurious transmissions through the filter at frequencies other than those in the primary passband. By employing conventional type i.f. transformers at the input and output ends of the filter, these spurious signals are attenuated. Signal frequencies of plus or minus 20 kc. from the i.f. (435 kc. and 475 kc.) are cut by a minimum of 40 db. Frequencies above 475 kc. and below 435 kc. are far enough away from the rest of the receiver's passband to be blocked, and thus be of no consequence. Input and output impedance is 10,000 ohms. Capacitive coupling is required to prevent B+ on the input side from getting to the output side, which is in the grid circuit of the next stage, and to prevent B+ from shorting to ground. In order to minimize the number of connections to the filter, the bottom leads of the windings in both transformers are already connected to the ground foil on the filter's printed circuit board. Only three connections are needed: plate, grid, and ground. Construction. The only parts you will need, in addition to the mechanical filter, are two 10,000-ohm, 1/2-watt resistors, CR1 and R2), two 0.001-μf. ceramic disc capacitors (C1 and C2), a 1" x 1" piece of Vectorbord or other suitable material, six push-in terminals, and an L-shaped mounting bracket. Except for the removal of the first i.f. 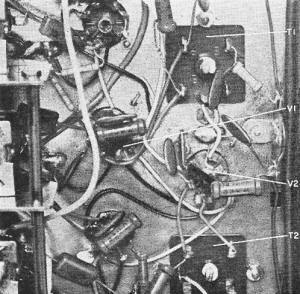 transformer, all components and connections in your receiver or transceiver remain the same. 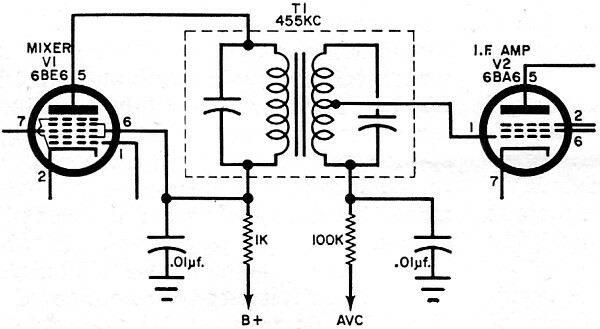 A typical circuit before modifications is shown in Fig. 2. Variations in component values or in i.f. transformer design in different receivers are not critical and will not adversely affect the installation of the filter. 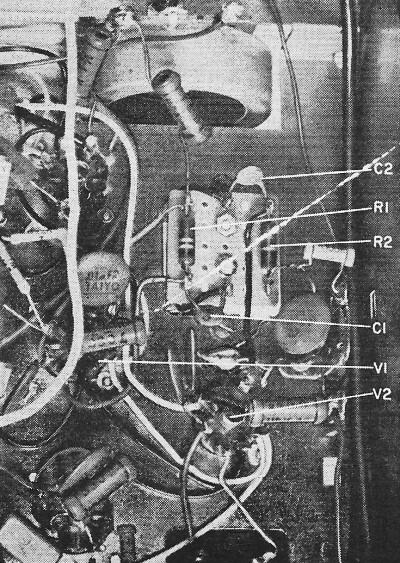 Figure 3 shows the same portion of the receiver after the filter has been installed. 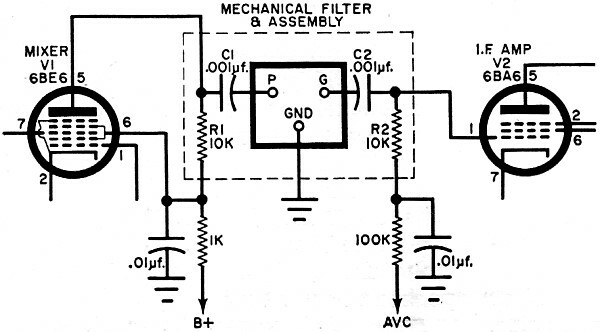 The actual filter and additional components are mounted on a subassembly as shown in Fig. 4. While it is not necessary to shield the filter - its components are already housed in metal cans which have been grounded to the printed circuit board - it is necessary to have a good ground connection between the board and the receiver's chassis. The one-inch-square piece of Vectorbord is bolted to the bottom of the L-shaped bracket. Resistors R1 and R2 and capacitors C1 and C2 are mounted on the board. 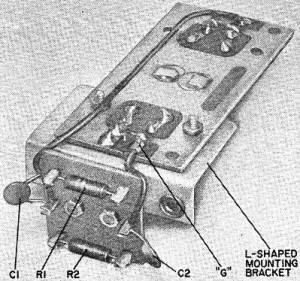 The push-in terminals serve to hold the components and the connections to the receiver. Before and after photos show how the subassembly is mounted on the chassis. Check to see that the board fits in the chassis opening, to fully seat the bracket. Alignment. Generally, once the filter assembly has been installed, no further alignment is necessary. However, you might try to peak the remaining i.f. transformers in the receiver. Just in case the two transformers on the filter have been diddled with, they too should be aligned for maximum output at the designated intermediate frequency. Fig. 6 - After the first i.f. transformer is removed, the mechanical filter subassembly is installed, and held in place by two screws. The board should be made small enough to pass through chassis opening. Fig. 7 - Above-the-chassis view of mechanical filter mounted in place of T1. Insertion loss is on the order of 1.5 to 3 db.